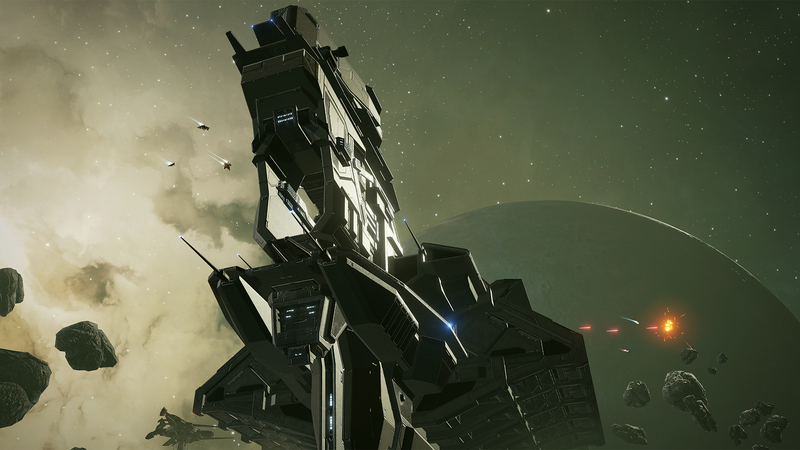 My second foray into the EVE universe (Gunjack review here) has you once again shooting enemies deep within the void of Space. However, unlike its predecessor you now have full control of you ship in this combat simulator. Currently available on the PSVR and Occulus Rift(I reviewed the PSVR version) for $80, that price tag suggests a full experience but may come up short considering the price tag and your gaming interests. First off, I want to say that this game has ruined Dog fighting shooters for me, in a good way. I don’t know how I could go back to playing these types without VR. Awesome barely begins to describe how it feels to be behind the controls of a small fighter ship while flying through ship yards and debris fields while in full combat. The mechanics here are solid. A variety of ship types offer different weapons, abilities and flight controls. Using a standard controller, flight is smooth and once you master angling your ship while turning, you feel like a master pilot. All the basics are here to make a stellar dog fighting game, but for the price tag, more than the basics is what’s missing. 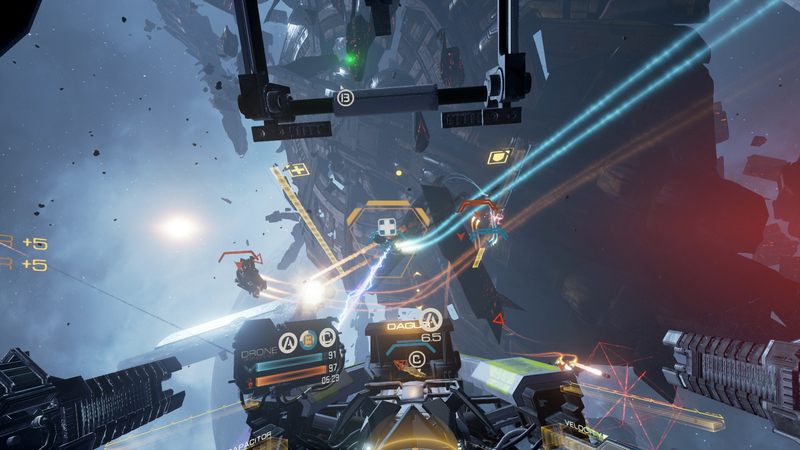 What’s here is one the most impressive, immersive experiences you can have in VR…and every time you take out an enemy ship is gratifying! Valkyrie has both single and multiplayer modes, but both feel a little stripped down. Single player has you replaying missions from your past lives which works, but there is only a handful of levels so just when you are starting to get into the story, it ends. Other single player options include tutorials for each ship you unlock and “Where’s Waldo” mode which has you searching the same levels you played in the missions(minus any enemies), only you are tasked with finding salvage and “memories”, the former of which expands on the universe and characters that interact with you. What’s there is good, and even navigating through levels alone is both breathtaking and a little unnerving. Looking for salvage wears out its welcome long before you’ll find all the booty hidden throughout the level, so you may find yourself playing this mode in small doses. With the limited single player campaign, one would think the focus would be on the multiplayer aspect of the game, and you would be right, but not completely. Once again, what’s here is great, it’s just not enough. Multiplayer levels are the exact same levels you’ve seen in the single player missions so there is only 5 of them. Added to that are only 3 different modes, all of them 8 vs 8. Team Death Match, Control and Carrier Assault. Control has you taking over points scattered around the map with a finite amount of lives(similar to the Battlefield franchise of games) while Carrier Assault has you destroying/defending shield generators around a map so you can assault/protect said Carrier and win the match. All these modes play out great, fire fights are hectic and navigating the map is dizzyingly awe inspiring. One odd note is the lack of mic support while actually playing, making these team coordinated attacks feel more like lone wolf missions. 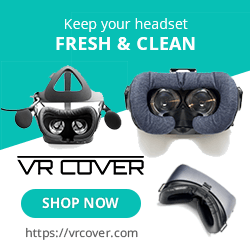 The scope of some of the environmental elements is mind blowing in VR!!! What also impresses here are the visuals. The maps you play on are a delight to look at. Scale is at times massive and until the game tells you have ventured to far away from the map, the universe seems endless. Ships are highly detailed and even the environmental stuff will have you just staring at it in awe. Subtle animations like when your ship first starts up or even the menu screen show how much care was putting into making this feel real. Upon close inspection though textures can appear washed out and blocky, but in all honesty they don’t detract from the game and you will be so busy playing that barely have time to notice the minor flaws. Audio as well is top notch, music and sound effects are exactly what you would expect from a AAA title and the voice acting as well(Katie Sackoff!) is top notch, though everyone is really, really serious and dour. My one final note is the micro transactions in the game. They are pretty standard (unfortunately) in gaming now and the ones here are no different, but they are mostly cosmetic. Gold is what you pay real money for and exchange that for silver, which is used to purchase upgrades, decals, paint jobs and other superficial add-ons. You can earn silver just through playing the game so as long as you are willing to grind a bit, all the purchasable content is available to everyone. Thankfully that content is mostly superficial so you won’t be getting outclassed by people with deep pockets and it makes spending more on this game optional, not necessary. I may have derided this game a fair bit, but what’s here is still a spectacle. As I said, I can’t go back to non VR Combat Sims and it’s because of this game specifically. Although limited in content the presentation and polish here have yet to be out done. In the middle of hectic dog fight while narrowly dodging other ships and obstacle is an edge of your seat experience that will have you smiling every step of the way. It’s great, it’s fun and it works and hopefully with time the developer expands and adds more content making this the complete experience it deserves to be. What would I pay? $60US is fine. I would have like a little more single player content, but the the multiplayer is an absolute blast and thankfully the controls here are top notch as well.